This month's @MISSBISH #MISSDISH is a protein-packed version of good ole fried rice that is the easiest way to use up leftovers in the fridge! Fried rice is a one of my favorite indulgences - there's something so easy and lazy about it. A one-stop-shop that has carbs, protein, and veggies all in one. I've been trying to cut down on carbs (lol so hard) and switching out rice with quinoa is the perfect for doing this. You can probably tell from the influx of quinoa recipes on the blog lately lol! This recipe is super simple, especially when you've got all the ingredients prepped before-hand. Rinse uncooked quinoa. Bring 2 cups water and quinoa to a boil in a saucepan, season with salt. Reduce the heat to medium-low, and cover, simmering until quinoa is tender and water has been absorbed, about 15-20 minutes. Remove the quinoa from the saucepan and let it cool, fluffing it with a fork. Remove the tofu from its packaging, draining as much of the water it's packaged in, and place it on a plate. Wrap it gently in paper towels, which will help to draw out the excess moisture so it's ready for frying. Once the paper towels are soaked thru and the tofu is relatively dry, slice the block of tofu into 1" cubes. Wash, peel, and dice the carrot. Dice 1/4 onion. Clean and cut up the head of broccoli into smaller florets. Peel and either grate or julienne a 1" knob of ginger. Adding a fluffy egg omelette to fried rice is an easy way to pump up the nutrition! Simply beat 2 eggs, seasoning the eggs with salt and pepper. Heat a non-stick skillet over medium-high heat with a tiny drizzle of extra virgin olive oil. Pour in egg mixture. The mixture should set immediately at the edges. 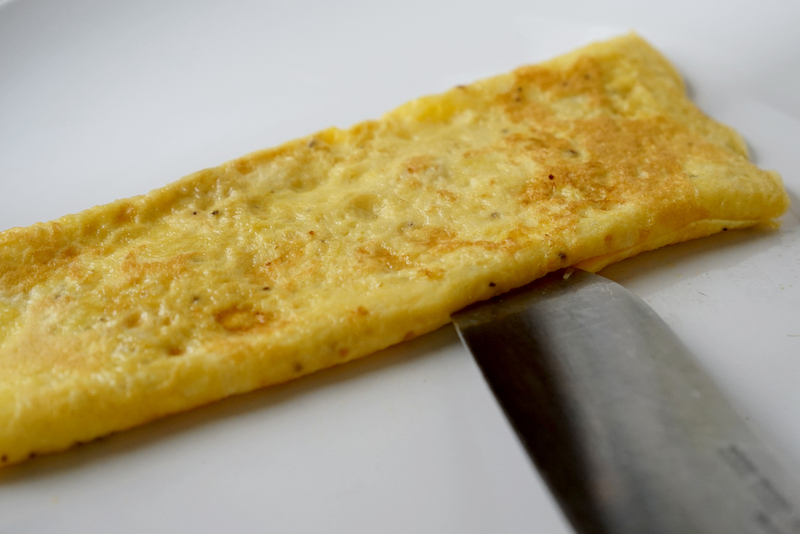 Allow the eggs to set up, and use a spatula to lift up one of the edges, gently folding it 1/3 of the way. Flip the egg onto itself, remove from the heat and slice into thin strips. Place aside. In the same skillet, heat some EVOO over medium heat. Add garlic, ginger, onions, and carrots and sauté until tender and fragrant. Place aside. 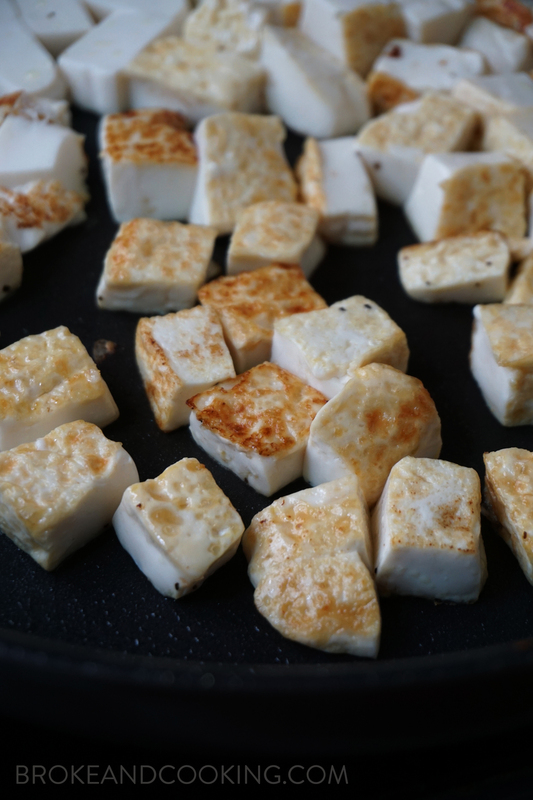 Fry the cubes of tofu over medium-high heat, turning frequently to avoid burning. I love pan-fried tofu! There's something about the nice crisp outer skin and the silkiness inside that is so satisfying. 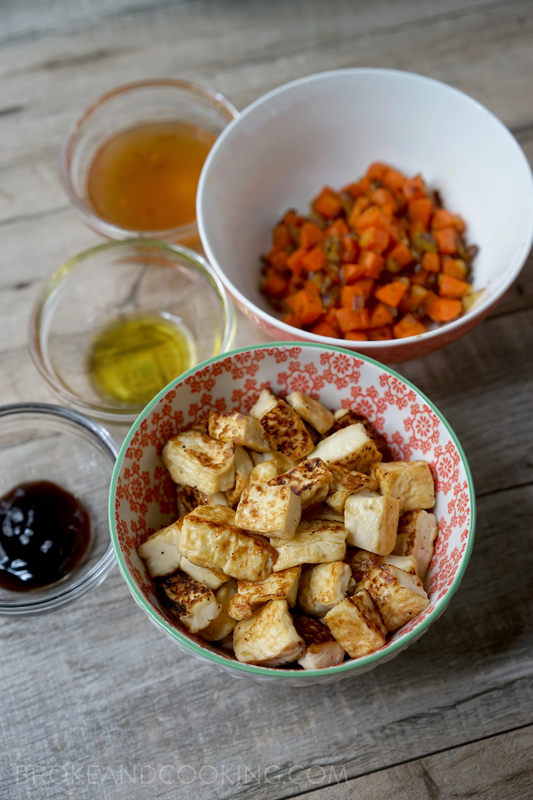 Adding pan-fried tofu is a great sub for a lighter meal - plus it's a nice boost of protein! Place aside. My favorite trick for cooking greens is a really quick steam-sauté. Heat the same skillet over medium heat, adding a drizzle of extra virgin olive oil. Add the broccoli, and few splashes of chicken broth. Season with salt and pepper, or my favorite technique is to add a few teaspoons of oyster sauce. Cover and let it cook 3-5 minutes, until fork tender, stirring occasionally. This is an awesome way to cook veggies quickly! Now that everything is prepped, dump it all back in the skillet! I like to add the tofu last, so that they don't break up too much. The fresh ginger is a really nice addition that brings some gentle heat to the table, and the mix of salty and savory oyster sauce is nicely balanced with the sweetness of the plum sauce. I love all the textures in this dish! The pop of quinoa, tender carrots and broccoli, soft, fluffy egg strips, and hearty tofu make this a really satisfying meal. Hope you give it a try!